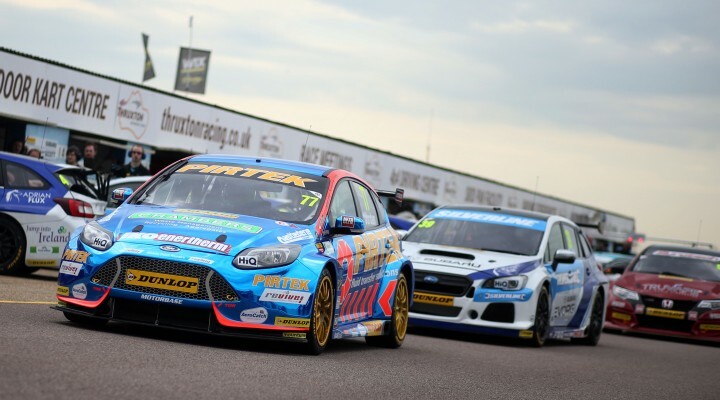 Andrew Jordan, in his Pirtek Racing Ford Focus, topped the time-sheets in opening Dunlop MSA British Touring Car Championship free practice session at Thruxton. Big things are expected of Jordan this weekend as he arrives at the Hampshire venue ballast-free and with an impressive history at the UK’s fastest circuit. The 2013 champion has taken pole position in three of the last four seasons here, although his return of only one victory will be something he’ll be looking to improve upon. The Motorbase Performance driver was quickly into his stride during FP1 and moved to the summit of the timesheets relatively early on, whilst MG’s Josh Cook slotted in behind – just 0.024s off the pace. Although there were improvements for some late on, few made inroads at the top of the order, whilst others faced far bigger problems. Sam Tordoff’s session ended prematurely with a fuel pressure problem in his BMW 125i M Sports while Colin Turkington’s Subaru came to a halt at the final chicane. There was some joy for the Ulsterman, however, as he set the third fastest time in the session. A red flag was thrown in the final ten minutes when Adam Morgan suffered a high speed crash on the exit of Allard. Morgan was fine, but the same unfortunately couldn’t be said for his WIX Racing Mercedes, which is need of some repair. The Lancastrian ended the session inside the top ten. Mat Jackson backed up the pace of the Ford Focus by finishing fourth, ahead of local man Rob Collard in his Team JCT600 with GardX BMW. Tom Ingram endured a puncture punctuated session, with a number of teams adjusting camber settings in search of the ultimate set-up at the high-speed circuit, but the young race winner still brought his Speedworks Toyota home in sixth. Jack Goff and Sam Tordoff made in three BMWs in the top eight, whilst Eurotech’s Jeff Smith followed in ninth.